Times were different when Hunter Killer’s source material, novel Firing Point, was first optioned in 2011. Eight years of political discourse later, Hunter Killer is a bizarre, militaristic anomaly. The international flavor invites Cold War comparison as a rogue Russian general tries to incite a war with the US. 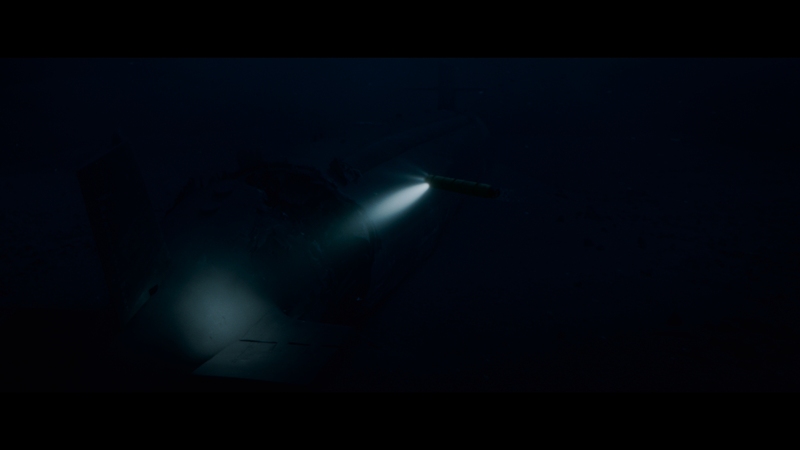 Inside the Pentagon, events jump from the screen with Michael Bay-esque sweeping cameras, settling down inside the confines of an American submarine charged with sleuthing what happened. CSI: Navy, with Gerard Butler leading the sub as a rookie Captain. 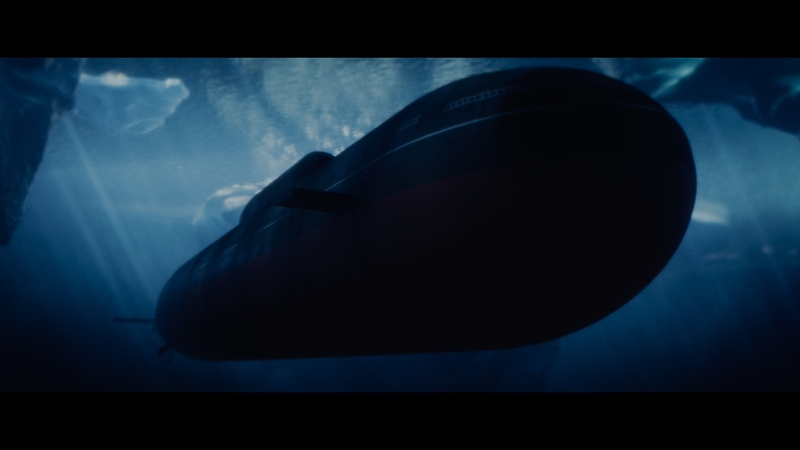 Hunter Killer will enjoy the chance to use all of the submarine movie elements. The tense quiet, sonar pings, torpedo exchanges, drifts through minefields, and bickering between officers. 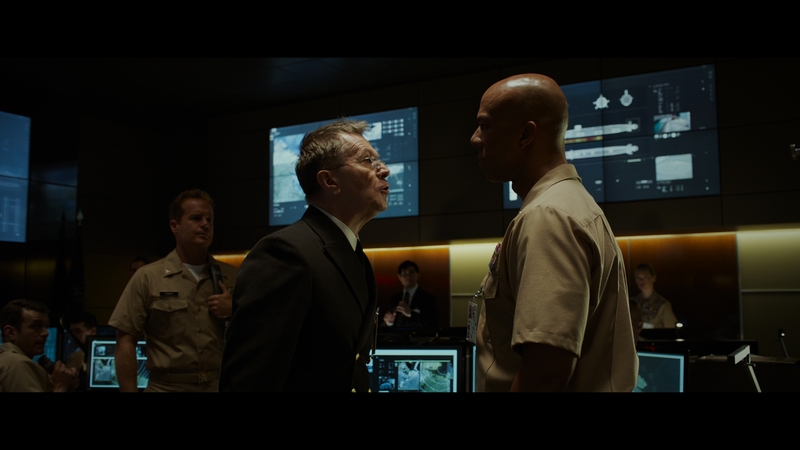 In that, Hunter Killer is indistinct yet competent, able to raise fears of a missile strike while Butler shouts at his crew to dive. Ignore that The Hunt for Red October did this with infinitely more tension. That’s not it for Hunter Killer though. It’s playing in a bizarre landscape, with Russian and American forces joined together for common good. Hunter Killer’s Russian president? A good guy, caught up a coup. The insinuation then is that Russian is a neutral good – not a genuine enemy – rather corrupted by interior forces. There’s trust between these two opposing sides, suggesting a decidedly Trump-like view that relations with Russia help, ignoring the nation’s underhanded influence. Good people, both sides, and without any critique. No worries – America remains the hyper-powerful military force. 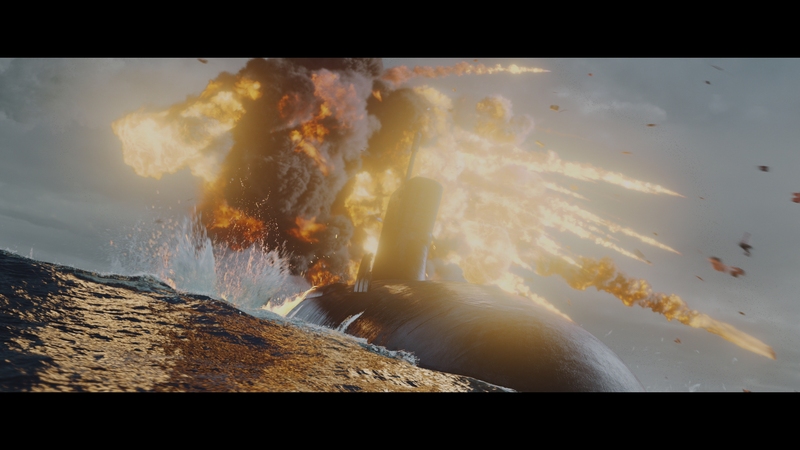 Hunter Killer adores technology, using visual effects to depict various gadgets, both offensive and defensive. Away from the sub, an American Black Ops crew runs through Russian territory to rescue the Russian president, all of the stealthy headshots and precision tactics on full display. There’s a thesis here that fighting brings people together. Onboard the US sub is a Russian commander, sharing tactics as they take dual control. Repairing fractures between nations is easy – tense, but easy: install a common enemy. This is done with generic dialog, flippant Generals at the Pentagon, and numerous shots of missiles/torpedoes homing in on their targets. Even aside from its wacky political leanings, Hunter Killer’s aspirations never rise above the genre’s formulaic flourishes. It’s neither satisfying in character or action, cramped by interior shots as well as budget. Stock footage from the IMAX documentary Aircraft Carrier, a film about shared wargames, fills in for scenes of Russian and American fleets heading for a clash. That’s disingenuous at best. Hunter Killer avoids any issues of resolution. It’s commanding in sharpness and texture. Close-ups on Butler and crew display marvelous fidelity, and with consistency. Exterior shots of snowy mountainscapes or oceans elevate the imagery with substantial clarity. Hunter Killer has its share of digital noise, but nothing impacts these establishing views. Even when dealing with noise, it’s unobtrusive to the interior of the subs. The Dolby Vision pass gives Hunter Killer arguably too much brightness, especially when considering the minimal light inside subs. Highlights stand out, bright and saturated while minimizing detail in certain shots. Certainly, depth runs high. Deep blacks and strong highlights will do that. Color shifts dramatically between shots. Deep blues merge with slightly elevated flesh tones, the two frequently overtaking the scenery totally to represent interior lighting. Outside, primaries stand out, particularly when showing off a military base. Color-coded worker uniforms add pop. Kudos to the compression team on this one. Underwater footage involves strong, dense blue with hazy atmosphere. That’s asking for an issue, but Hunter Killer avoids banding and artifacts. 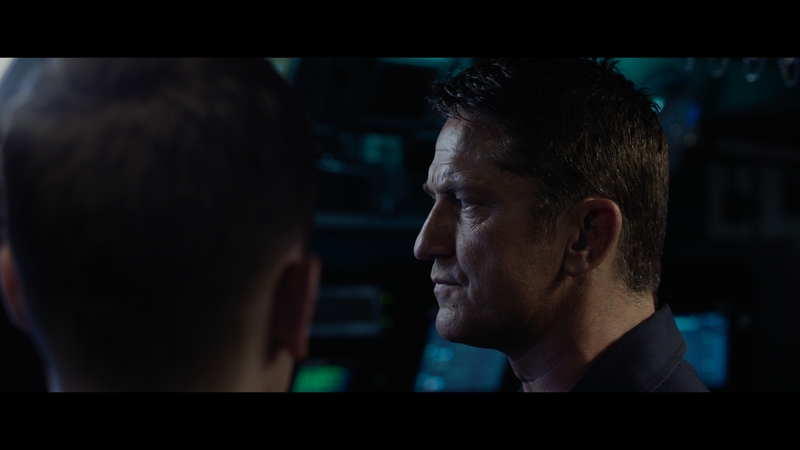 Color and contrast balance out better on Hunter Killer’s Blu-ray. Both look stretched less than on UHD. Flesh tones still carry a push toward orange and while contrast stays high, rarely does it clip. Likewise, black levels produce needed dimension. Detail remains, firm, and rich in texture. However, noise takes on more prominence. Some underwater banding is likely unavoidable, as is some visible compression when in deep ocean. Overall though a fantastic Blu-ray. With great range, the flurry of traded missiles and underwater explosions do their best to push a subwoofer to extremes. Satisfying rumble from engines, panning missiles, and even above-ground gunfire earn balanced acknowledgment from the low-end. It’s a nice variety, always tight and powerful. Likewise, being trapped inside a tube underwater is a constant source of potential ambiance. High-end moments blast the hull, rattling metal around the soundfield. But even when going silent, the hum of computers and rush of water maintain constant presence. 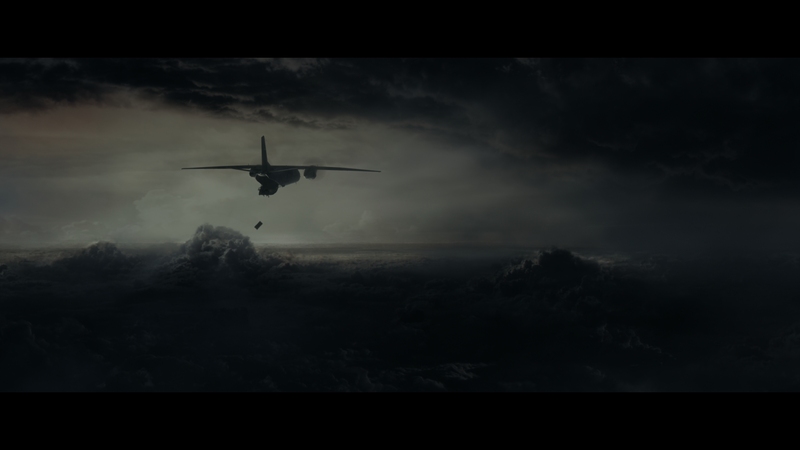 As with any great mix, Hunter Killer’s Atmos environment betters the movie by placing viewers alongside the characters. Director Donovan Marsh heads into the booth for a solo commentary. Afterward, the well produced 24-minute Surface Tension uses plenty of behind-the-scenes footage and interviews for a better-than-average feature. Gerard Butler makes a Russian friend in the mistimed submarine movie Hunter Killer that makes peace through war (and torpedoes).